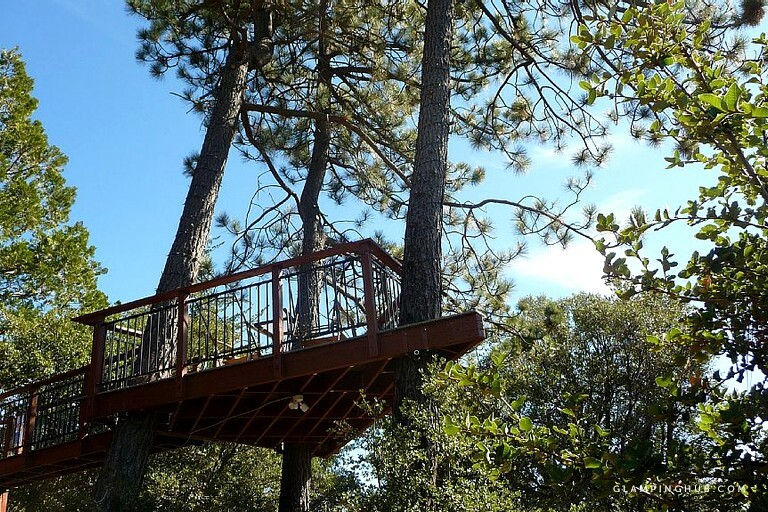 Perched on the mountains of Julian, California, this luxurious tree house is tucked amongst the trees, making it the perfect glamping getaway. With beautiful new hardwood floors, a private tree deck, and even a home theater, this tree house cabin is a truly unique glamping experience. 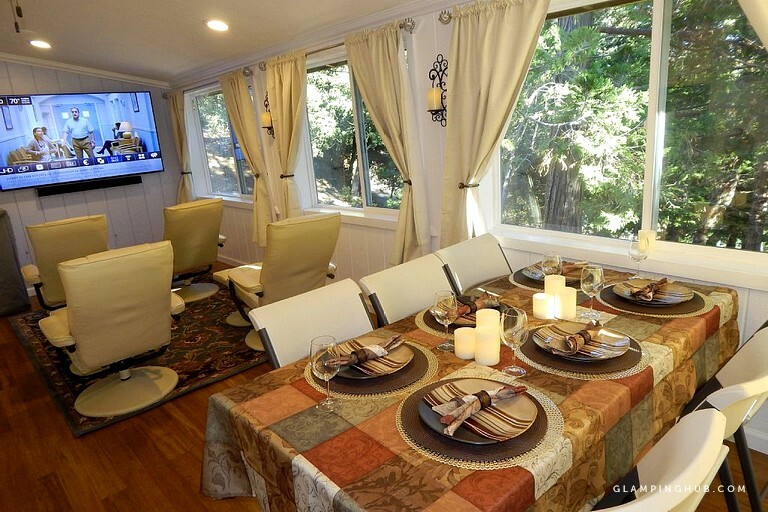 Inside guests will find sleeping for up to six people. This includes one bedroom with a queen-sized bed, a queen-sized sofa bed in the living room, and two new twin-sized roll-aways. Sheets, blankets, and pillows are provided. 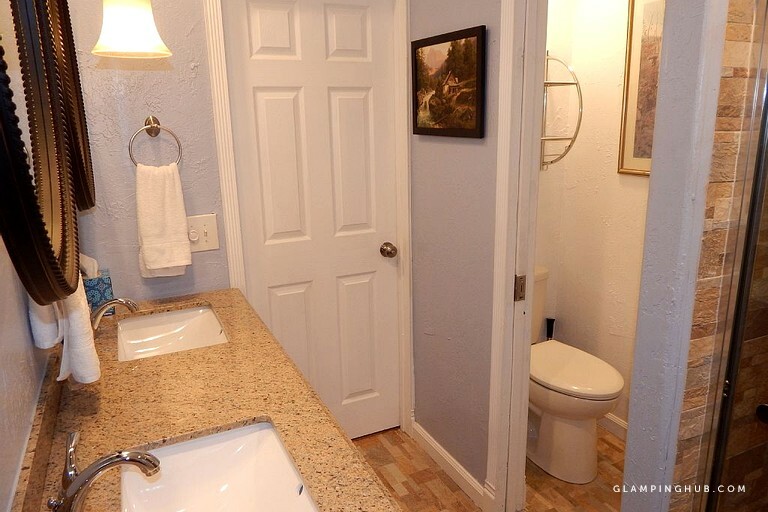 Guests will have a large bathroom, recently remodeled, including a luxurious glass-door shower, mosaic ceramic rock flooring, and dual-vanity under-mount sinks with granite counter tops. Linens and towels are provided, as well as convenient dispensers containing soap, shower gel, shampoo, and conditioner. 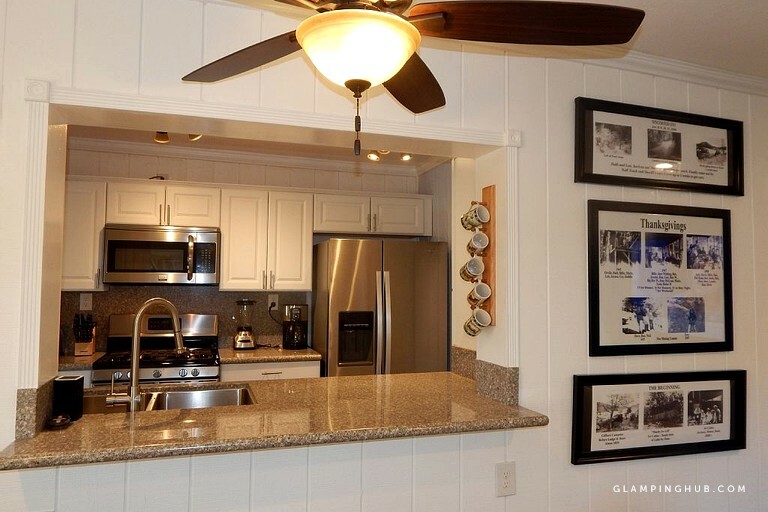 The kitchen comes equipped with new all stainless steel appliances, including a high-end gas range, a convection oven, and a high-end built-in microwave. 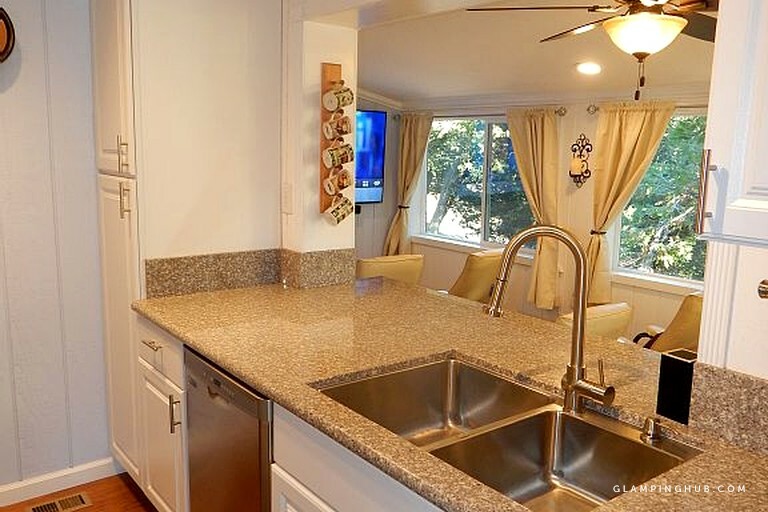 This tree house also offers guests a dishwasher, a refrigerator with an ice and water dispenser, granite counter tops, and a state-of-the-art toaster. 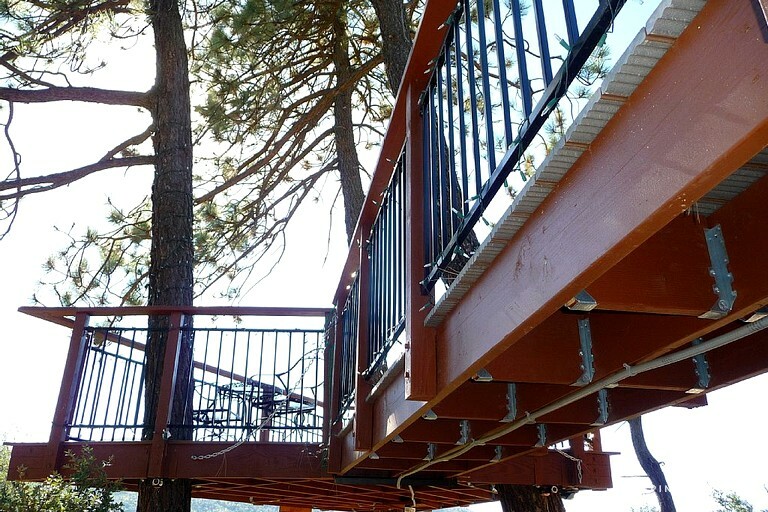 Outside guests will have a private main deck connected by a floating bridge that crosses over to the tree house observation deck. 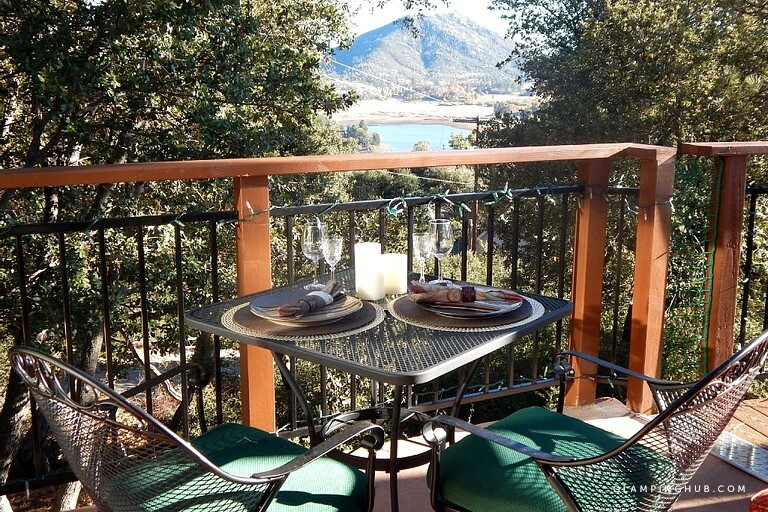 Guests will also find an outdoor gas BBQ, available for outdoor cooking enjoyment. 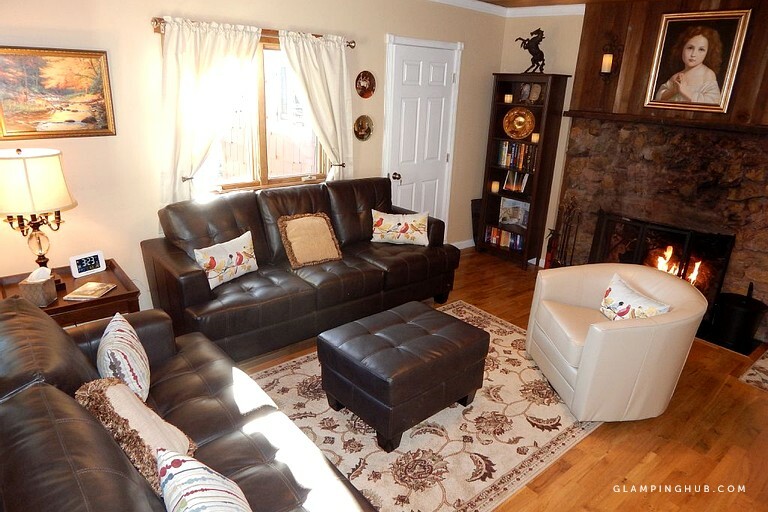 In the winter, guests can enjoy a large wood burning fireplace. 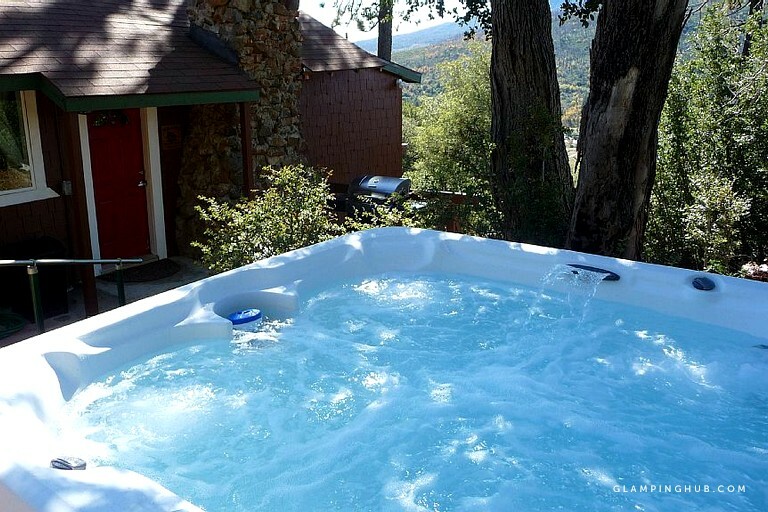 This property also offers an outdoor spa for guests to relax and simply let their problems melt away. 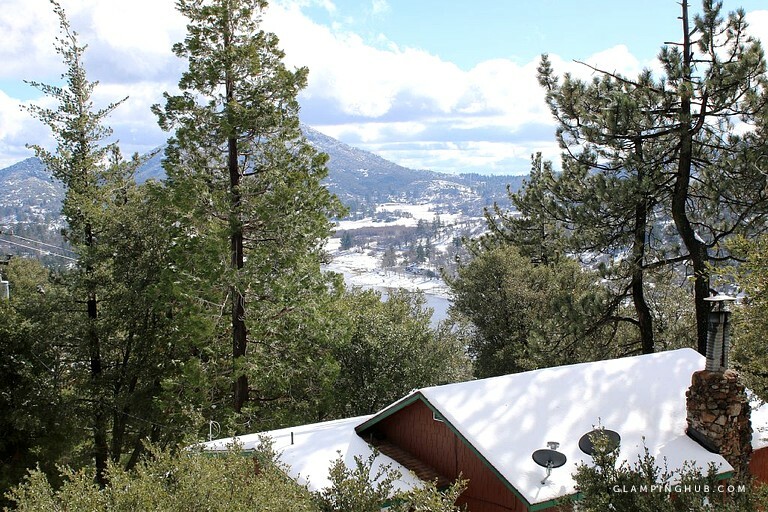 This tree house chalet is located up a mountain and is a five-minute walk from the designated parking area, which is approximately 37 feet below the chalet. 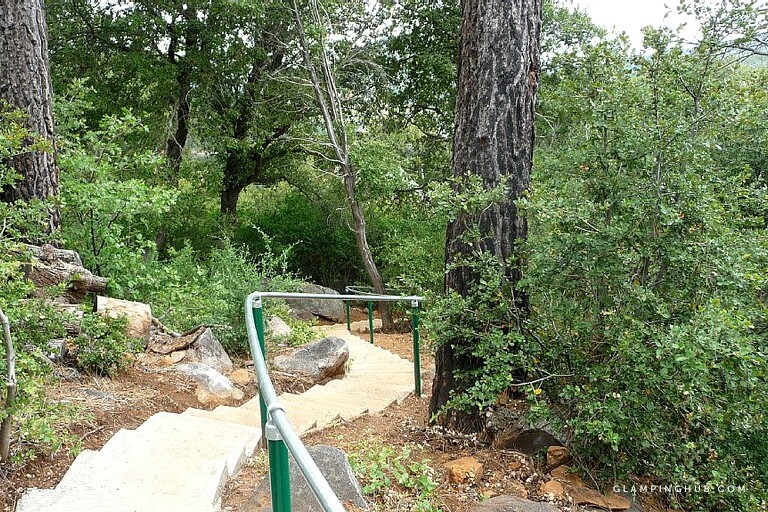 Guests may take the meandering staircase, which offers hand rails for those in need or may take the "Hidden Trail" as an alternative trail walk up to the chalet. 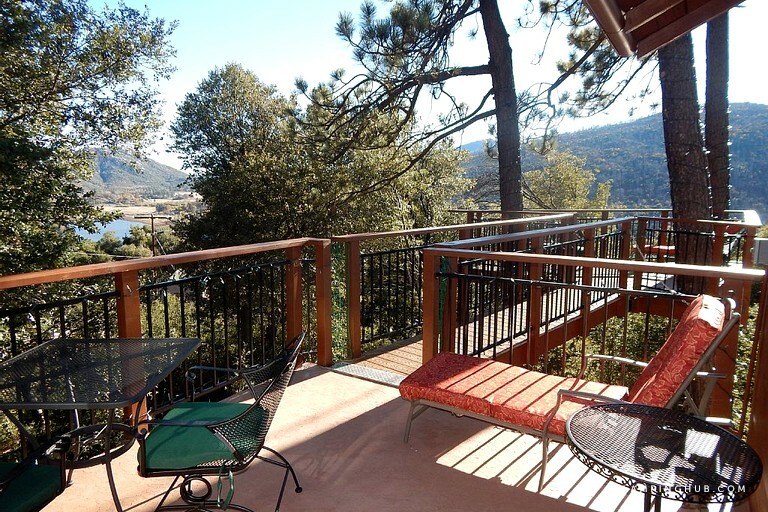 This tree house comes with a private home theater where guests can experience movies and sporting events on a 70-inch screen with an amazing sound system while lounging on plush leather recliners. Guests will also find their own observation deck which offers views of the surrounding forest and all the way to the Pacific Ocean. This observation area also includes a telescope for guests’ enjoyment. 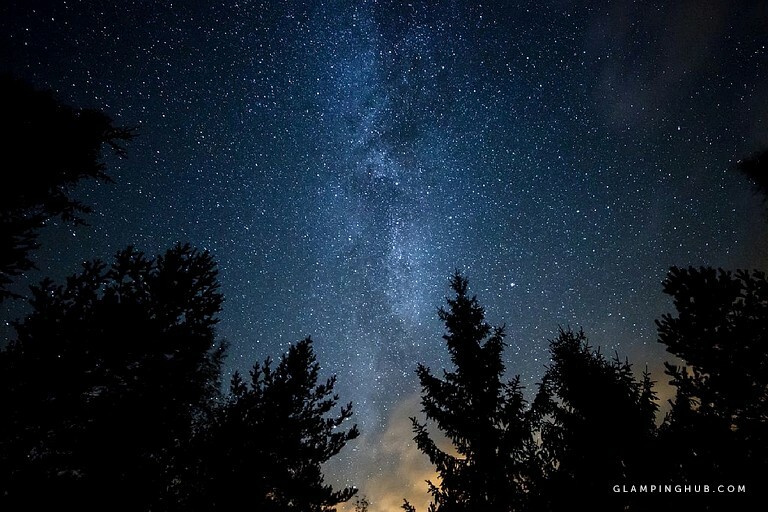 On a clear night, guests can view the Milky Way with thousands and thousands of stars and planets. There’s also a new outdoor spa and a fully furnished gourmet kitchen which includes two outdoor barbecue grills. 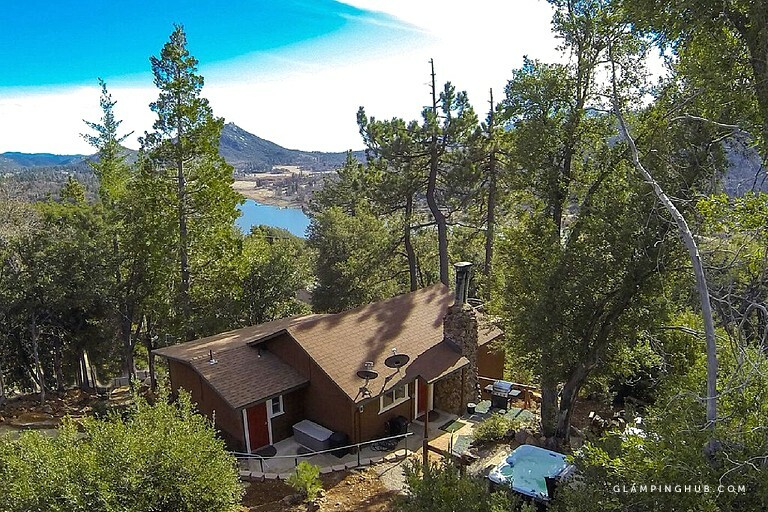 This property is located in Julian, California, which overlooks the breathtaking Cuyamaca Lake at an elevation of over 5,000 feet. 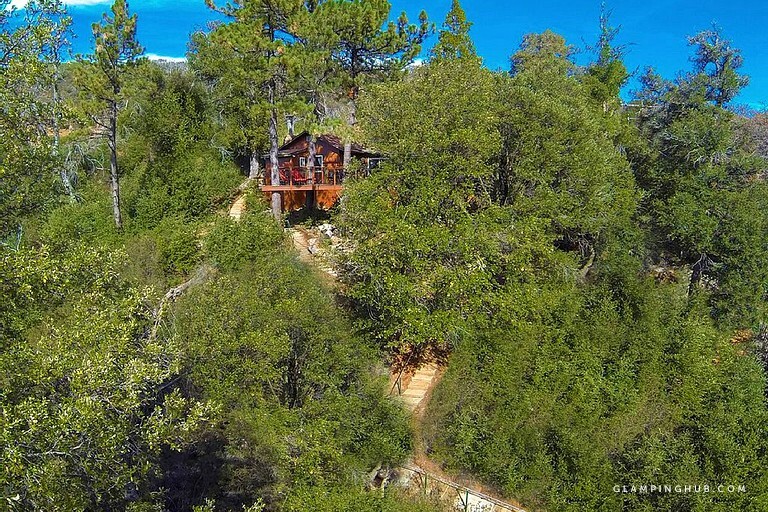 This tree house chalet is located in a private lake resort which sits on one acre of forest. The surrounding old growth trees are nearly 300 years old and provide an enchanting backdrop for a perfect tree house cottage stay. 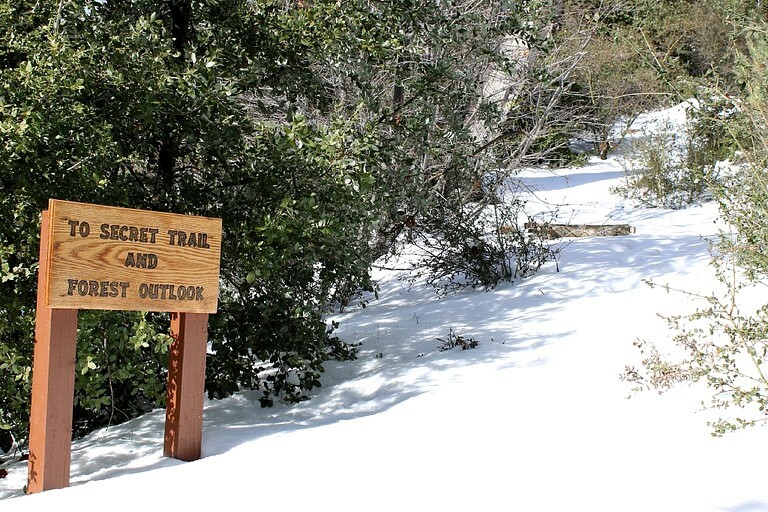 Cross over the amazing floating bridge and climb up to the top of three large Coulter Pines, and you’ll be looking down on thousands of acres of State Park and National Forests. 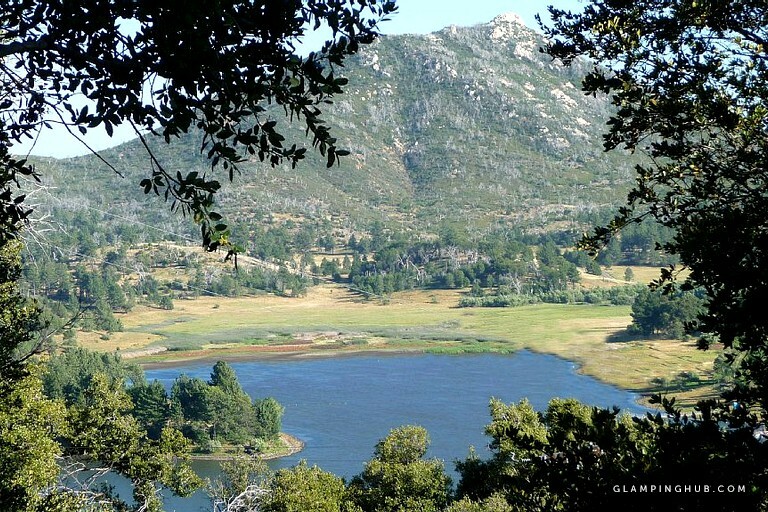 This glamping site is just minutes from the turn-of-the-century town of Julian, founded in 1870. 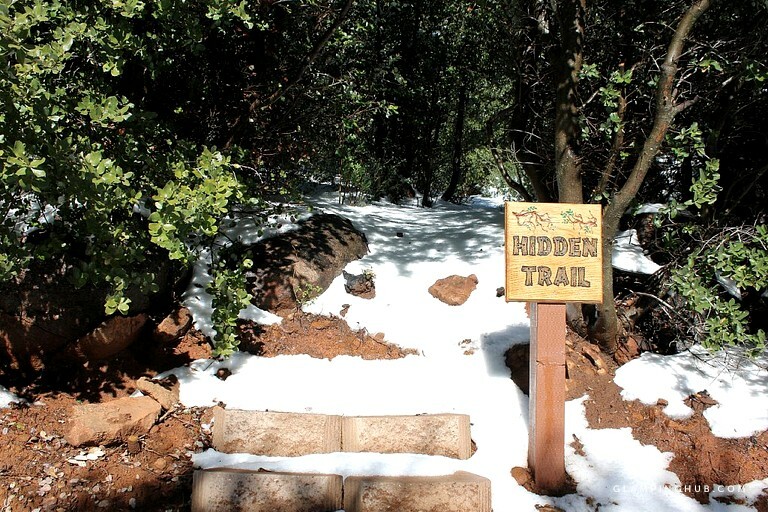 Julian is where guests can enjoy clean mountain air, forests teaming with wildlife, crisp clear night skies. 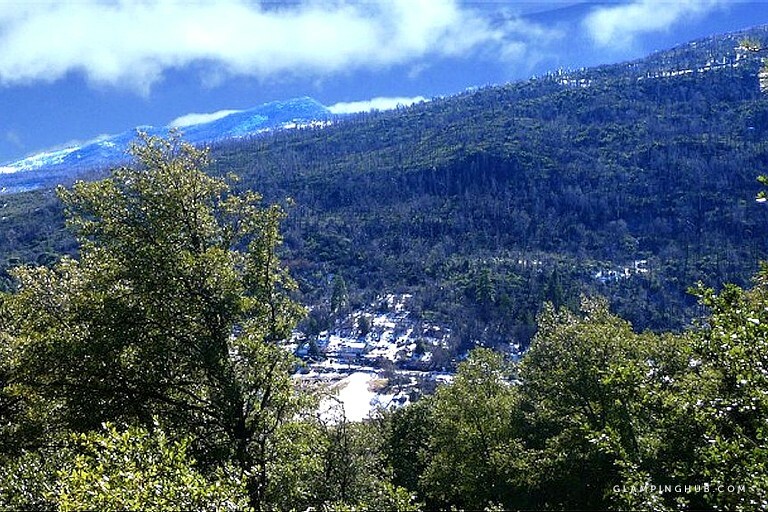 The Cleveland National Forest, Heise State Park, and Cuyamaca State are all close by. 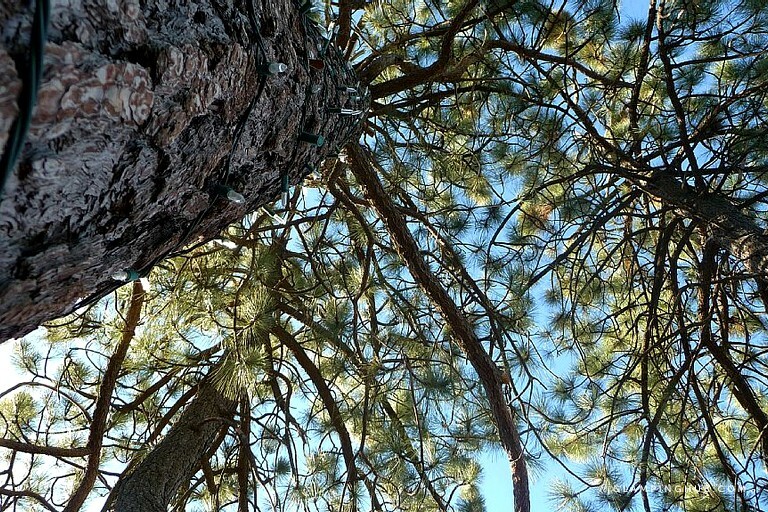 Head to Fletcher Island for a picnic, shopping, or dining as well as a variety of cultural activities from The Julian Wolf Preserve to the Gold Mine Museum. What guests will love most is getting in touch with nature and going hiking, biking, boating, or even horseback riding. There are over 40 wineries in the area for those who want to relax and sample some local California wine. 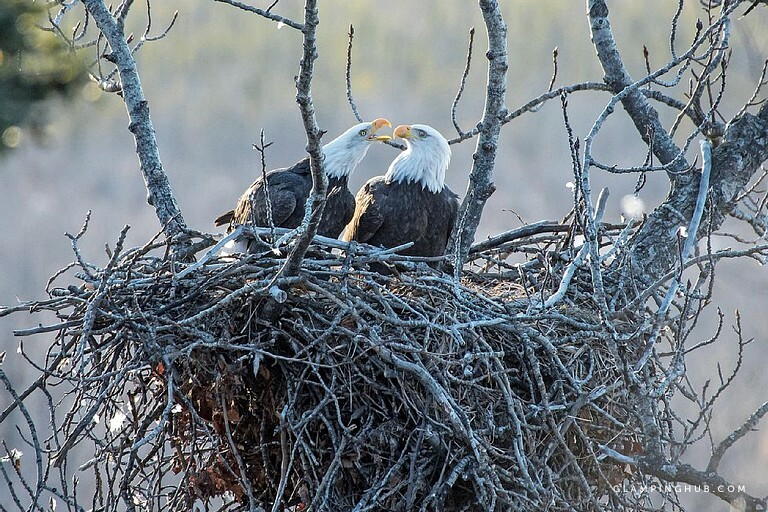 If guests are into bird watching or photography, this is a great place for both. If visiting in the fall, the Julian Apple Festival, which takes place in September and October, offers some of the best apple pie in the area. 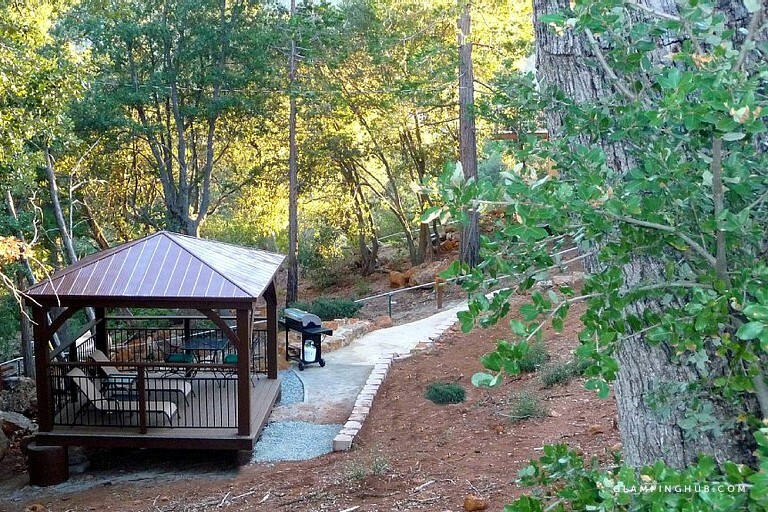 This property is also about 20 minutes from Cedar Creek Falls, which boasts magnificent 80-foot waterfalls, Warner Springs, and Borrego Springs desert. This area also has golf courses, two of the best being the Palomar Observatory and The Oasis Camel Dairy. It’s only about an hour to the Pacific Ocean with its beautiful beaches, and if you want to venture off site you can visit the Safari Park, the San Diego Zoo, the Aquatica and even the Agua Caliente Hot Springs. Guests must be at least 25 years of age in order to make a reservation. Otherwise, contact host prior to making a reservation. Please contact the host if there is a special event or group gathering function planned and if any additional persons, other than registered guests, will be invited during their stay. 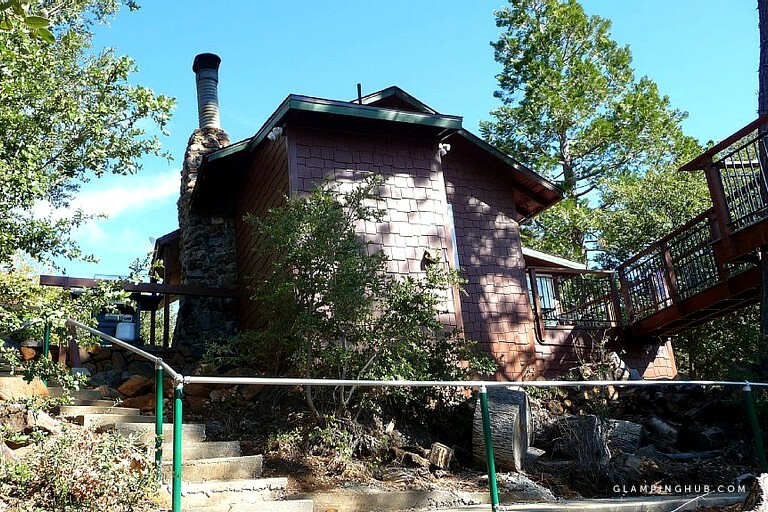 From the parking lot to the cabin, there is a two-minute walk on meandering steps. For those who need assistance, the steps come equipped with handrails. This property requires a $300 damage deposit upon confirmation. There is no smoking or pets allowed on the glamping site. Linens are provided. 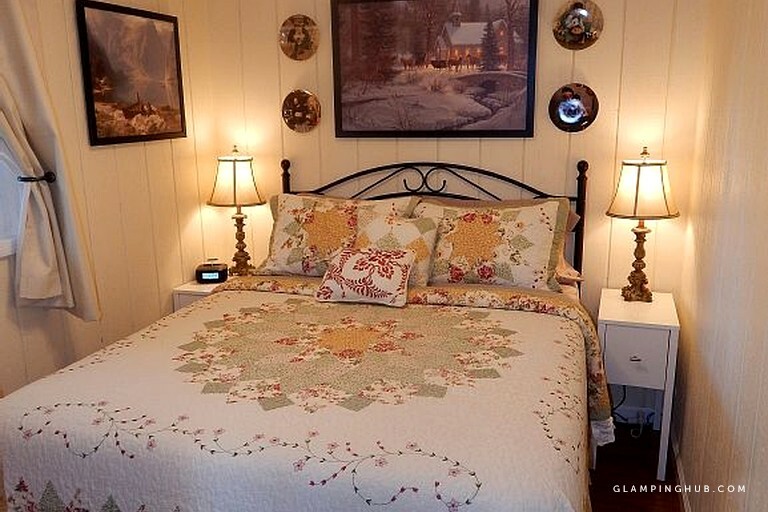 Additional $12 per person per night after the first two guests. The maximum capacity is six people (including guests and visitors).